Our third annual Public Facing Report, produced for our funders Health and Care Research Wales, summarises our progress in key areas of research between April 2017 and March 2018. The report is a great way to keep the public and wider community informed of our achievements in research development from over the last year. It has been a year in which the Centre has continued to drive its mission of improving the health and wellbeing of the population of Wales. To achieve this, we have continued to enable large numbers of successful funding bids, securing over £6.5 million in funding. We are also working to translate our quality, evidence-based research findings to inform public services and government decision making. 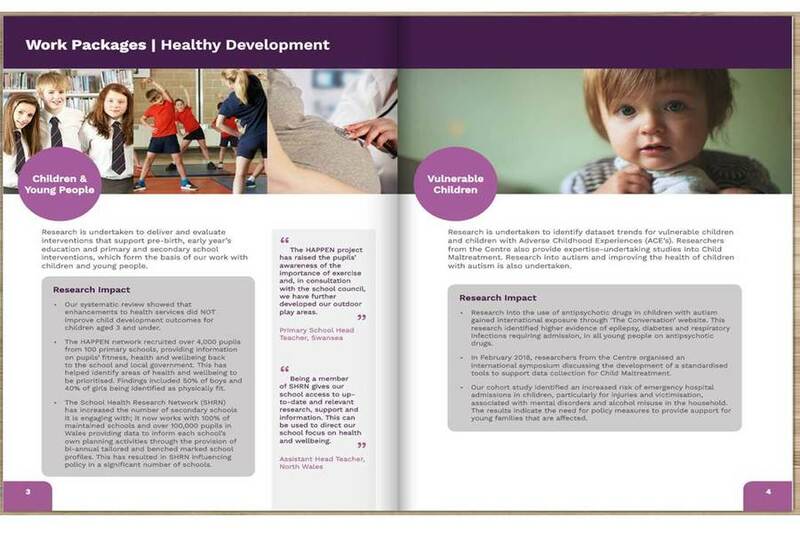 In last year’s report, we identified how our research was showing impact in health and beyond. This year our focus has been to show the results and impact from our research into children and young people and healthy ageing. Our researchers are working on some of society’s biggest problems and our work is helping to bring about positive change, find out more and click and flip through our Public Facing Report below….